Jerry Rice is a retired American football player. He played as a wide receiver for the San Francisco 49ers, the Oakland Raiders, the Seattle Seahawks and the Denver Broncos of the NFL. He was the NFL Network's greatest player in NFL history in the TV series "The Top 100: NFL's Greatest Players". He won 3 Super Bowls and an AFC Championship during his career. He is widely regarded as one of the best NFL players of all time and the best wide receiver of all time. He was married to Jacqueline Bernice Mitchell for 22 years. They have 3 children together. He competed in the reality show "Dancing with the Stars" in 2005. He reached the final 2, but he lost. w:Jerry Rice signing autographs in 2006. Jerry Rice is a famous American football player, who was born on October 13, 1962. As a person born on this date, Jerry Rice is listed in our database as the 4th most popular celebrity for the day (October 13) and the 22nd most popular for the year (1962). People born on October 13 fall under the Zodiac sign of Libra, the Scales. 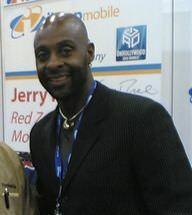 Jerry Rice is the 142nd most popular Libra. Aside from information specific to Jerry Rice's birthday, Jerry Rice is the 1045th most famous American. In general, Jerry Rice ranks as the 1779th most popular famous person, and the 57th most popular footballer of all time. “The Famous Birthdays” catalogs over 25,000 famous people, everyone from actors to singers to scientists to serial killers and more. If you're curious to see who was born on your birthday, you can use our database to find out who, what, where, when and why. You can search by birthday, birthplace, claim to fame or any other information by typing in the search box, or simply browse our site by selecting the month, the day, the horoscope, or any other clickable option.